Geringer Global Travel designs truly bespoke vacations. We listen to create a custom itinerary that fulfills your dreams and sense of adventure. Now is the time to experience the beauty and magic of India and the Subcontinent. We offer tours featuring adventure, art, architecture, culinary, culture, festivals, local customs, luxury, religion, wildlife and special immersion experiences for India, Bhutan, Nepal and Sri Lanka. Geringer Global Travel designs custom tours tailored to each traveler’s specifications. 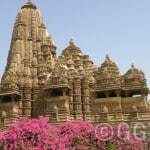 As experts in India and the Subcontinent, we will show you this part of the world in a special way. 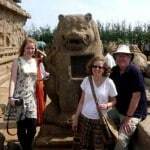 Featured India Tours, Bhutan Tours, Sri Lanka Tours, and Nepal Tours. 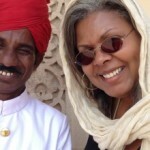 We were so fortunate to plan our personalized Indian adventure with Susan Geringer. She really listened to what we wanted to experience and put together an outstanding and diverse itinerary. She and her team in India provided excellent service and a trip of a lifetime. We would highly recommend her services! The trip exceeded all our expectations. Because we needed to customize our tour to India and were unable to have our requirements met either here in Australia or in India we resorted to the Internet and discovered this India tour company. This company was always punctual with their replies and Susan was incredibly patient, tolerant and extremely helpful with advice during the planning of our trip. The ground staff that Susan uses in India was amazing and was always prepared to go the extra mile to ensure that our trip was a memorable one. Thanks very much for putting together a wonderful trip. We enjoyed the entire trip immensely, but the standouts for us were Mussourie, Varanasi and Mysore. Looking back on it, we would not change a single thing in our itinerary. Thank you so much for arranging a wonderful first trip to India for me. As a female traveling solo it was important to me to have someone that would take time to understand me and the type of travel experience I was aiming for–you took time to listen to my needs and ‘nailed it.’ It was the right balance of touring, immersion, learning and creating magical memorable moments that will forever be etched in my mind. From standing in the Taj Mahal and feeling the love from which it was built, to having the cool waters of the river Ganges run through my fingers as I watched the sunrise, to spending time talking with the children at the different organizations and schools I visited, to learning how to make my favorite Indian meals. I truly enjoyed my 21 days in India and came away with some beautiful pictures as well. Thank you for crafting a wonderful safe journey for me. I look forward to having many more in India–there is so much more to see and do. Next stop…southern India. Thank you Susan! Our vacation in India was a wonderful adventure. We were a little hesitant at first about traveling with 4 women, including 2 teenagers, but we felt very well cared for and safe. The tour guides were a wealth of information, and we learned about culture, architecture, history and food. Our drivers were always there for us as well. 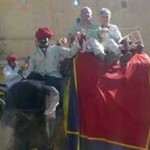 The guides and drivers helped us better understand the culture of India and added greatly to the experience. There was no stress in worrying about where to go or who to meet. It was very easy and allowed us to really focus on all the amazing things to do, see and eat while in India. The hotels were amazing at every city. The service in India is on a different level than we have ever experienced. The food was also incredible. We ended up eating mostly in the hotels, but almost every meal was excellent. The people of India were very friendly and gracious. We enjoyed our few minutes of fame having our pictures taken as one of the few Westerners at some of the tourist sites. 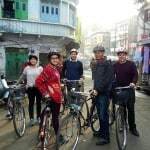 The four of us thought that the highlights of the trip were: the Rickshaw ride in Old Delhi, the aarti ceremony in Varanasi and the beautiful rafting trip in Uletokpo, Ladakh. You were so knowledgeable and great to work with. Going to India was a once-in-a-lifetime experience. I don’t think any of us would change any part of it for the world. Best time ever! Thanks again for a great trip. Susan, your guidance helped us design the perfect trip, even with all of our constraints, including needing to meet up with our studying-abroad daughter midway through and then travel to areas relevant to her study. All the logistics were completely seamless and we were extremely well taken care of everywhere. The highlights for us were all the situations you arranged for us that gave us opportunities for discussion with local people of all castes and trades, giving us real insights into their lives and today’s India. We can’t thank you enough! We really had a wonderful time on our trip to India and want to thank you for all your help! Although the four of us are very seasoned travelers (especially in developing countries), we were somewhat apprehensive about traveling to India. We wanted to see different parts of India and its culture, but did not want the majority of our trip just navigating the challenges of driving on the crowded “roads”. You were extremely helpful in guiding us, so that in additon to the luxury train, the rest of the trip you planned included much of what we wanted to see. You spent much time talking to us, so that you would understand what we wanted to experience and learn. Your recommendations and advice ranged from general areas to visit and transportation alternatives to specific sights and things to do. Once the challenge of the actual itinerary was finalized, you quickly arranged all the logistics of the trip. 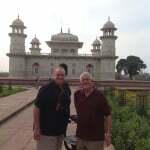 Our 18 day trip to India was wonderful! Your advice and recommendations were excellent and everything was so well organized. Our guides, drivers etc were extremely knowledgeable and friendly. We had an amazing trip – luxury train through Rajasthan, Khajuraho, Varanasi and Agra, followed by the incredible Ellora and Ajanta Caves, finishing up at two Taj safari lodges (and an incredible tiger sighting)! We appreciate all your efforts in making our trip to India a very special experience! Our family took a trip of a life time with Geringer Global Travel. We spent a total of 7 days in India and 8 days in Sri Lanka. We have traveled around the globe with several different luxury travel companies, however, Susan was willing to work with us on a truly bespoke vacation. Unlike many larger outfits, Susan listened to us and created a unique itinerary that fulfilled our adventurous lifestyles. We had such a wonderful experience that we plan to work with Susan on our next trip. There was excellent communication and a few conference calls in the planning process. We were asked specific questions about the purpose of our trip and the activities that interest us. As the trip was planned, each of our needs was met and we felt confident that our dream vacation would be achieved because of the attention to detail. During our trip we received calls from the travel company in India used by this travel specialist. They were following up on the quality of the hotels, drivers, guides and communication was outstanding. We know they would have been able to help us if we needed to change or add anything to our itinerary. The highlight was definitely interaction with local people. This was planned in advance and met or exceeded our expectations as we were able to have in depth discussions about art, history and local traditions and culture. Mary and Andy W.Mary and Andy W.
YET ANOTHER SATISFIED CUSTOMER And it isn’t easy for me to be satisfied. I am a professional photographer and my wife is an interior designer and we have traveled to a lot of wonderful places on this planet. We have traveled for both work and pleasure, but India was going to be a personal adventure. 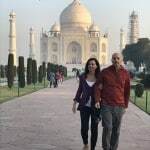 I have never met Susan in person and I am sure few of her clients do, but what a great person to help you realize your dreams of your trip to India. I found Susan through online research which I did for over a year. Susan did everything we asked for plus added so much more. She is very detailed oriented and will speak her mind if she thinks you are going the wrong way. Her counterparts in India were the best, providing the most amazing service we have ever experienced. They even gave us a cell phone with a direct line for help if needed! Never did. I know I am not alone in praising Susan Geringer Global Travel, but it had to be done! 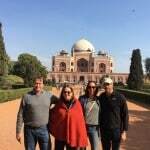 Due to work demands, this particular India trip couldn’t have happened without the help of the expertise of Susan Geringer at Geringer Global Travel. We were able to tie down all the key sites and logistics of the various destinations in two-weeks/only in a few emails/and couple of phone calls. The promptness and expertise in which the feedback was given really helped. The operations on the ground were excellent. They were there to meet us from the start and every city we traveled. They were prompt, watchful and anticipated our every need. We felt safe, and pampered throughout our 12-day trip including tours/and airport and train transfers. Hotel selections were also excellent and fit our budget. Susan Geringer helped us create the trip of a lifetime. She listened, made suggestions, adjusted and followed up with every detail under a fairly tight timeline. It was clear from her interactions with us that she was focused on developing an itinerary that fit what we wanted. She connected us with guides, drivers and activities in India and Bhutan that made our month-long adventure filled with surprises and cultural experiences all along the way. The quality of her support and follow through made us feel at home even when we were so far away. We would recommend Susan as an exemplary travel agent for this area of the world because she has traveled so extensively herself and had built strong relationships with those on the ground who she interacts with on a daily basis. We are so grateful to Susan for making this dream come true for us. My dream was to travel to India, however it seemed to be a daunting task and quite frankly I was intimidated. Ever since I began teaching yoga in 2001 I longed to travel there. A friend referred me to Susan Geringer and my husband and I took the trip that I had yearned for. Every detail was exquisitely orchestrated. Our trip was the best we have ever taken. Susan is a superb travel consultant. I highly recommend her! 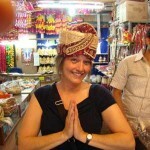 Planning a trip to India feels like a daunting experience till you talk to Susan. From the beginning she understood what we wanted and set it up with careful detail. Traveling during our 12 day trip was incredibly easy. Our trip was structured in minute detail and to be honest we had no need to think too much about, except, enjoy every minute of our experience. We stayed at the Rambagh Palace in Jaipur which was quite an introduction to India. We have to say that all the hotels we stayed at were spectacular. Service varied from city to city but was always impecable. One of the most memorable part of our trip was waking up to the sounds of birds with and our room facing the rise of the sun in Jaipur. As an architect I felt cheated in my architectural history classes. India is full of incredible historic buildings and amazing architectural details. Fatepur Sikri, a city only lived by Akbar, a Moghul Emperor for 14 years was a fabuous stop on our way to Agra. Of course the Taj Mahal is never better than when seen in person and waking up with the distant view of it was another highlight. Must be said that Agra is much more than the Taj Mahal and you become more appreciative of its magnificence once you have visited all of the other Moghul Architecture sites. Delhi which we visited next is a bustling city full of the intermix of Hindu, Muslim, Mogul and British architecture. It is hard to explain the feelings that one experiences in between such vast history, culture, opulence, religion and poverty. India was a spiritual journey of self discovery on what really matters. Exploring Old Delhi with it´s multiple markets,contrasts, electric cables, cows, rickshaws, tuck tucks, and people redifines your sense of space, environment and even purpose. Humayan´s Tomb stands in Delhi in sharp contrast to the Taj Mahal and helped us understand the development of Moghul architecture. Varanasi was our next stop and we were sad to leave Omvir our driver, as we were flying out. He had treated us with such gentle caring. We flew into a chaotic and spiritual city at the basin of the Ganges. It was a hard stop. It was bustling with tons of people as we walked around the Old part to reach the riverbed were Hindu cremation is constantly happening. This was a close encounter with mortality and disturbing in a way. Looking back I don´t think we would have understood India without going to Varanasi, but while there, the feelings were quite disturbing. We ended our journey in Mumbai and to our surprise it is a clean and incredibly interesting city. Our tour guides for the 3 days in Mubai were the best we had. Our city tour guide´s knowledge of Hindu spirituality and structure really helped us understand all we had learned about during the first part of our trip. We then took a 5:00 am Market tour of Mumbai and had no idea the treat we would be in for. This was a total highlight and we would recommend it to anyone. Our guide was smart, knowledgeable and funny and made the tour even more enjoyable. Our last day we had booked an architecture tour of the city and were surprised to be matched with a restoration architect who works in the city. Her devotion and love for her work and her city was just the end to a wonderful trip. Our last 2 days were less packed which was good as we were able to enjoy shopping around and the hotel pool and amazing restaurants. Before our trip Susan had given us a restaurant guide and made some restaurant reservations and all were spot on. We had incredible food all around and still talk of the aubergines in yellow sauce we ate at our hotel in Varanasi. 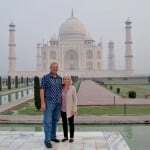 We would recommend Geringer Global Travel to anyone planning a trip to India and are sure to use her again if we were to visit any other location she manages. We stayed in incredible hotels, discovered, ate, learned and enjoyed every single moment of our short 13 days. Thank you for making our trip a lifetime experience. 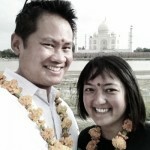 Our first trip to India could not have been any better planned. The itinerary, pace, choice of hotels, and local guides all made for a most interesting and enjoyable experience. You left us wanting for nothing and hungry for more! We will definitely recommend you to anyone who is planning a trip to India. And we can’t wait to have you plan our next India adventure! We had an amazing family vacation to India. Thank you for all of the meticulous details in your planning. We felt truly fulfilled in our cultural experience. The only thing better would have been more time in India. Thanks for all you organized. Overall, the trip was great. We had a fabulous experience and saw and experienced many many marvelous things. We were very well cared-for by the drivers. I cannot say enough nice things about our driver which we had from Udaipur to Delhi. He was courteous and prompt and accommodating and attentive to our wants and needs. He seemed to know where everything was; never needing directions. But, most importantly, he kept us safe. The guides were friendly, accommodating and knowledgeable about the sites we visited. We liked all the tour guides. They paced our tours according to our own interests, spending more time on items which we found fascinating. I very much appreciated their professionalism. While the weather was quite hot throughout our trip, we were fortunate that we were hardly bothered by rain, even though it was during India’s monsoon season. 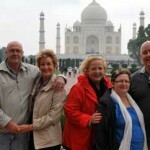 Our trip consisted of 13 nights in India, starting June 22 and ending on July 5. We started in Goa (2 nights). We then flew to Udaipur (3 nights). Next we drove Jaipur (3 nights). Following this, we drove to Agra (2 nights). We ended our India experience in Delhi (3 nights). In Jaipur, we stayed at the Samode Haveli hotel. Without question, this was the best hotel of our trip. Overall, really nice. Jim, Gloria and Francine C.
Jim, Gloria and Francine C.Jim, Gloria and Francine C.
My wife and kids (ages 18, 22, and 24) and I just arrived home from two truly special weeks in India. We can’t thank you enough for all the time and attention you spent arranging this trip for us. We're not novice travelers and expect that things won’t always go as planned, but this trip went with nary a hitch. We traveled by van and plane between seven cities plus all the local sightseeing destinations with not one connection or handoff missed. To say the coordination was impressive would be an extreme understatement. Thank you also for recommending just the right mix of accommodations and restaurants. Our rooms in Varanasi were certainly a highlight, to say nothing of our lavish accommodations in Ranthambore. Between the preparation and service, every meal was a treat everywhere we went, and I’d be remiss not to mention how big a part our guides and drivers played in making our trip even that much more memorable. It was a trip I would recommend to everybody, and with your help, it was about as easy as crossing the street. Susan will tailor your trip to your interests and pays excellent attention to detail. She focuses on giving you the most memorable vacation ever! 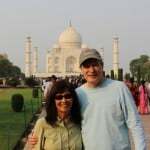 We cannot say enough about the wonderful advise and excellent arrangements that Susan Geringer provided for our trip to India. Susan listened to our wishes and preferences and suggested options that immediately felt right. She then patiently continued to work with us as we asked a million questions. In short the trip was perfect! Her recommendations for hotels, the driver that she arranged for us, the guides, the restaurants and sights were spot on! We were taken care of from the moment we landed in Delhi until we were at the gate departing. 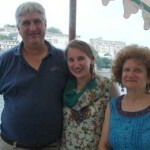 Susan coordinates with an excellent and professional agency in India so we were in excellent hands the entire time. Susan knows the country and her guidance and suggestions were invaluable. We were completely pleased with every aspect of our trip. You did a really spectacular job on our trip to India. The nuts and bolts — hotels, drivers, guides, airlines, train tickets, etc. — worked very smoothly. 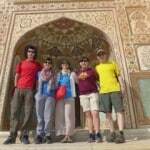 Your first hand knowledge of every site was really helpful in itinerary planning, so that we did not arrive at Agra or Aurangabad on a day the site is closed. You did a great job of customizing our itinerary. India is so huge and there is so much to see that we had to prioritize destinations. This was hard for us as there was so much we wanted to see. After much discussion about options, we followed your judgment to leave out Amritsar and use those days instead to go to Jaisalmer and Aurangabad. 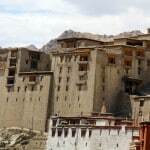 They turned out to be, along with Agra and Varanasi, the highlights of out trip, and it was your judgment we followed in choosing these places over other more standard options. We also decided to follow your judgments about taking a break in the middle of our trip to stay a few nights in farm areas. You told us we would be exhausted after the first week despite our being “in great shape” and being really curious and energetic tourists. You were so right. The time change, the flood of stimulation that is India, the “otherness” of it all really wore us out. We welcomed the downtime at a couple of ex-maharajah summer palaces to go bird watching, visit local villages, and just chill. Our special requests to you were fully honored by the in-country agency that actually books the guides and drivers, etc, so we were happy about that. On the negative side — well, I really can’t think of anything. You really listened to what we told her about what was important to us. I could tell by the way you customized our itinerary and kept refining it in response to our comments. That is probably the most important reason we chose you over the other options for a travel agent. The Taj Mahal, to which no picture can do justice; the Buddhist and Hindu caves at Aurangabad; bird-watching and relaxing in the luxury tents at Chhatra Sagur; the breath-taking sandstone fort and town of Jaisalmer; Varanasi, which is impossible to describe but should not be missed by anyone serious about understanding India; and an afternoon in Nizzamuddin basti, a medieval settlement. Our guide was a young resident who has pulled himself up to get an education with his own determination and talent, plus the essential help of an NGO. Our guide was an awesome young man who was a real inspiration to us both. 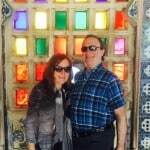 Norma and Randy M.Norma and Randy M.
Susan Geringer was unknown to us when we decided to utilize her services after reviewing ratings for our epic trip to India. She not only didn’t fail us, she provided us with superb service which surpassed our expectations! All details were provided with nothing being overlooked. We will not hesitate to use her services in the future as well! There were so many memorable parts to our trip including seeing where Ghandi was assassinted, the exploration of both old and new Delhi with all of the sites and smells (spices! ), religious components of Varanasi, the Taj Mahal (no pictures can capture the beauty and grandeur adequately), Goa and its night life and beaches, spice plantation; Sri Lanka with its beaches. 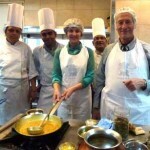 Oh and can’t forget high tea with a local family in Agra and the evening cooking demo in Jaipur. Sri Lanka was a most pleasant surprise! The people were absolutely friendly, the beaches were fantastic, and the people very pleasant. It was hard to believe these people had gone through a tsunami and a 30 year war. We stayed in the Bentota area. This island is often overlooked but should not be. So clean and progressive! 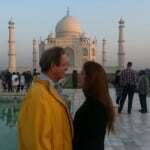 My wife and I just returned from a two-week trip to southern India to celebrate our 45th wedding anniversary. We have previously visited northern India. Having traveled to over 40 countries, we needed a travel advisor who was knowledgeable and a very good listener. Susan has all these sterling qualities and more. The trip she designed for us more than met our expectations. We had a perfect mix of seeing the sights and personally experiencing the warmth of the people and their culture. Unfortunately, my wife developed a medical emergency while in India. Susan and the ground operator were in constant contact with us. She rearranged our trip instantly and was instrumental in getting us expert medical care in Cochin. Her sensitivity and genuine concern were greatly appreciated. In summary, we highly recommend Susan based upon her multiple outstanding professional and personal qualities. Well, we're back from our four month Grand World Voyage with a lifetime of memories. 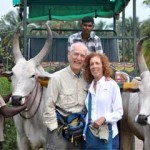 Many of our most favorite are of our eight day excursion in India. Everything went exactly as planned. The car was at Delhi airport waiting for us when we arrived and the hotel reservations were perfect. We had an excellent driver and knowledgeable, friendly guides. The city by city itinerary that you planned was marvelous and Marc and felt that we made the most of our time in each city. Susan, India was everything you said it would be and more. Marc and I cannot thank you enough for helping us plan this amazing adventure. We look forward to working with you again on our next trip to India. What an awesome trip! Dave and I cannot put in words how much we loved our almost 2 1/2-week journey; the people, the service, the hotels, the guides, the drivers, the food, the culture, the tradition, the religions, every aspect of the trip was beyond our expectations. When family and friends asked what we liked most about India, it’s really hard to name them all. How does one describe the tranquility of a boat-cruise on Lake Pichola and the Ganges, the hustle and bustle of the markets and local life, the beautiful wall carvings and constructions of the temples, the vibrancy in the colors of the houses and ghats, the majestic histories of the forts and palaces, the passion and the spirituality of the worshippers, the shimmer in the marble of the Taj Mahal and last but not least, the thrill of seeing tiger in the wild? It was truly an adventure of a lifetime and we cannot wait to go back to see the southern part of the country. Thank you for the personal touches, drinks with the local artist and cooking lesson / dinner with your friends, these were probably things we would not have experienced if it wasn’t for your recommendations. The parting gift was especially appreciated, we cannot wait to put it to good use. Thank you so much again for everything, we look forward to working with you soon. Our trip was incredible. We were met by a representative at each place we visited and were taken to our hotel…from hotel to the airport, etc. We did want to see as much as we could, within reason and thus moved around a lot. Susan suggested several unusual sites and experiences, such as taking a cooking class, which enhanced our trip. 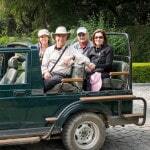 Our itinerary was supported by excellent guides and drivers. Visiting the Ajanta Caves and beautiful Udaipur and Kerala, meeting wonderful people in our travels and staying at great hotels was a very enjoyable part of our trip. We enjoyed Bhutan even in winter. Dale W and Susan P.
Dale W and Susan P.Dale W and Susan P.